It might not be Christmas quite yet, but here at WMG, Santa has come to town early—andit’s all because Retrieval Artist Miles Flint is on his “nice” list. 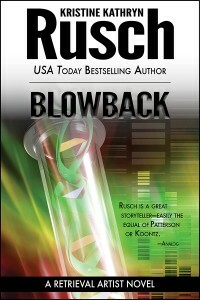 Blowback, the ninth novel in Kristine Kathryn Rusch’s Retrieval Artist series, debuts this Tuesday in ebook and print format, and it has already received wide acclaim. Want to learn more? You can even read an excerpt of the book on Rusch’s website, www.kristinekathrynrusch.com. Already sold? Click here to buy a signed copy, or heck, signed copies of the whole series. And that’s no Christmas miracle.